A very brief history of the Club from 1798 to the present day. The first recorded cricket player from Bray was in 1744; he was selected to play at the Artillery Ground in London. This was the year that the earliest known 'Code' for cricket was drawn up by certain "Noblemen and Gentlemen" who used that ground. This is also 6 years before the foundation of Hambledon Cricket Club. In 1746, 4 "millers of Bray hill" played a team of 4 from Addington in Surrey at the Artillery Ground, for 50 pounds. In 1755 the Laws of the game were revised, and they were further revised in 1774. Probably in 1777, three stumps were introduced. The first MCC Code of Laws was adopted in 1788. From 1774, records of cricket matches at Bray become frequent. At this stage, teams could be of almost any size, with singles and doubles matches being quite popular. Opposing teams quite often comprised different numbers of players, and large wagers were regularly placed on the results. During the later decades of the 1700's, 8 matches a year were normally played, and the Bray cricketers clearly fancied themselves (no change there, then !). There were regular matches against the MCC for substantial wagers, up to 1000 guineas (c.£150k. in present money); on at least one occasion the MCC failed to show up and forfeited their wager, because they were afraid of being "shamefully beaten" again. In 1853, the Club played against England in a two-innings match over two days, and won, albeit with the help of an extra 7 players ! The England side on that occasion included the illustrious names of John Lillywhite and John Wisden (who took 15 wickets in the two innings and scored nearly a third of the England runs). As 'recently' as 1858, the Bray cricketers took on "the World" on their Old Field ground. The Old Field ground is now buried under the Fisheries; it was on the Bray side of Chauntry Rd. between Oldfield Rd. and the Thames. 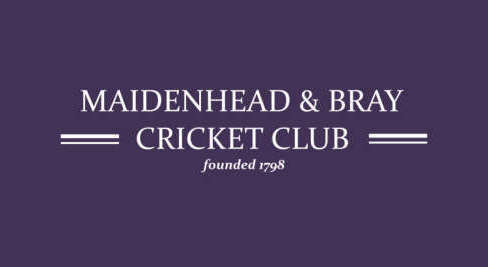 The Club was variously known as Maidenhead C.C., Bray C.C., Old Field Club, and even Berkshire - all the same names played for all these 'clubs' which never actually played against each other. The formal foundation date for the Club was probably in the 1790's. A Centenary was held in 1894, and the Maidenhead Advertiser reported the 128th AGM in 1926. The year 1798 therefore has been taken as the formal foundation of the Club. 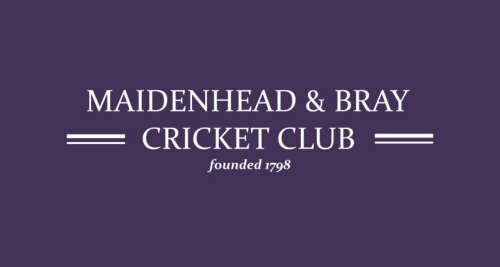 For several years between the World Wars, Maidenhead C.C. and Bray C.C. were separate clubs, each with their own ground. Bray C.C. moved to its present ground in the village near the church in 1919, and now has a second pitch across the road. The two clubs, Maidenhead and Bray, joined forces in 1946, and the ground and clubhouse are shared with the thriving Maidenhead Hockey Club from that time; Maidenhead & Bray Sports Club looks after the clubhouse and ground for both clubs. The Bicentenary was celebrated in 1998. Sir Michael Parkinson has been the President of the Club since 1987, and has added hugely to both the cricket and to the social sides. The annual 'Parkie Day' has been a high spot on the local calendar for years, with celebrity matches including such names as Imran Khan, Gower, Lillee, Atherton, Bairstow, Lamb, Emburey, Marsh, alongside Kenny Lynch, Billy Connolly, Annabel Croft, George Best, Jimmy Tarbuck, Angela Rippon, Ernie Wise, Chris Tarrant, Gary Lineker, and many others. The Club has twice been overall winner of the Thames Valley League (1976 & 1986). It now has four senior League teams and 1 Sunday team. The colts section is particularly strong, with seven boys teams competing in the Berkshire Youth Cricket League, - u9 (2 teams), u11 (2 teams), u13, u15, u17, and in recent years our teams have regularly been among the very best in the County; several of our colts play at county level, and one has played for England. We have regular colts coaching (c.250 colts), with many Club coaches available, of whom 5 are trained to Level 2. It is one of the few Berkshire clubs with a thriving girls cricket section and in 2016, we setup our first Ladies XI. The Club was the first club in Berkshire to gain the Clubmark from the ECB. The Club has one of the most beautiful grounds in a beautiful village, is rich in history, and is even richer in its members.